Calla Lily (lilies) or Zantedeschia are also known as arum lilies and are generally easy to care for in the garden. Zantedeschia aethiopica or ‘white calla lily’ is also known as the ‘Funeral Lily’. Z. aethiopica ‘Green Goddess’ is a Arum Lily with a great splash of green in the flower. 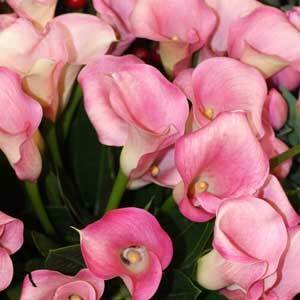 Zantedeschia elliotiana is a yellow species while Zantedeschia rehmannii has attractive pink flowers. Zantedeschia aethiopica cv. ‘Childsiana’ is a Dwarf White Arum Lily hybrid. And talking of hybrids we also have the new colorful releases with names like Hot Chocolate, Buttercup. Mango, Wine Red and Intrigue. With new colors such as ‘green goddess’ plus orange, pink (see picture right) and yellow forms as well as the traditional white forms now on the market, zantedeschia make a spectacular long lasting cut flower. 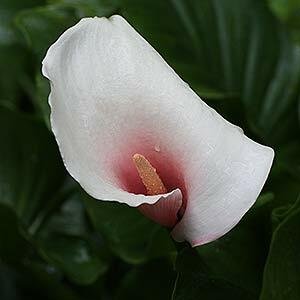 Zantedeschia or Calla Lilies are easy to grow although they do like a moist soil and a sunny sheltered position, and they do not like frost. Protection from the hot afternoon sun will help prolong flower life although adequate light is required to promote flower color especially in new cultivars. Plants do not need to be lifted in winter, although this is a great time to divide larger clumps. We do not use much fertilizer at all when growing these in the ground. With the newer smaller growing (dwarf) cultivars being grown in pots and containers we do suggest a general purpose slow release fertilizer, and maybe some of or favorite seaweed fertilizer in liquid form. Plants grown in containers may need to be divided every 3-4 years. Always wear gloves when handling as sap can irritate the skin and is poisonous.